Home Depot's Best Underlayment smoothes out little sub floor imperfections while quieting impact sound and floor to ceiling noise. Not only does it dampen ambient sound in the room it's installed in, but it also inhibits sound from traveling into the room below. 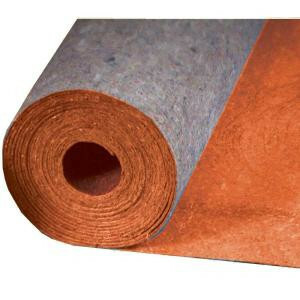 Although it is promoted as an upgrade underlayment taking the place of poly foam, it doesn't carry a heavy upgrade price when compared to cork or rubber. On the other hand, in recent head-to-head Sound Transmission Loss tests, Home Depot's Best Underlayment outperformed both cork and rubber in the majority of test band frequencies. Certified field sound tests were performed on an installation over a standard 6 in. concrete sub floor, and received an FIIC score of 71. Roll measures 400 in. x 36 in. x 1/8 in.